Jittery economy? Maybe, but at least on Saturday evenings, the Colonial Promenade Shopping Center can be a busy place. Money seems to be changing hands without too much difficulty at Alabaster’s Colonial Promenade. With the AmStar movie theaters, four restaurants and two ice cream places within walking distance of where I took this picture, parking spaces wind up at a premium some times. The week before, Colleen and I found waits of over an hour at a couple of restaurants at the Promenade. We finally had to drive north into Hoover. With scenes like these, I’d have to say that central Alabama’s economy could be in a lot worse shape! The latest numbers for home sales in the Shelby county and Birmingham area confirm that 2008 saw a significant downward slide in the market.Â A report by the Birmingham Association of Realtors shows home sales down by 29% for the year, compared to 2007. Average prices slipped by 5%, and the average number of days homes stayed on the market stood at 100 for 2008, up from 96 in 2007.Â Home sales for December, 2008 totaled 798, which is down by 32% compared to December, 2007. While 2008 home sales in Birmingham and Shelby County, Alabama dropped 29% compared to the year before, inventory continues to drop, and experts say the market remains poised to make a significant improvement. 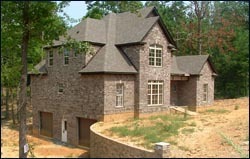 It’s interesting to compare these statistics with other markets.Â While home values in Birmingham lost 5%, prices dropped closer to 11% when averaged nationally, and 32% in California.Â So, as we have stated before, while our local market does wind up seeing most of the same trends that occur elsewhere in the country, the undulations in Birmingham and Shelby county home sales are typically nowhere near as extreme.Â And for that, we can be thankful. While our local market numbers aren’t what homeowners or people in the industry want to see, there is reason to be optimistic that home sales will pick back up.Â As people knowledgeable about real estate market trends are well known for saying, it’s only a matter of time. 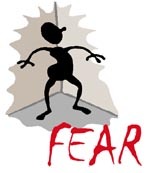 Negative news-saturated owners are facing fear about selling their homes. A good way to counter that is by obtaining expert information about what's happening with the market right here in Shelby county. With our climate of 24-hour negative news these days, a number of homeowners who would like to think about selling are having to deal with fear.Â Â You may be uneasy, wondering how long it will take to sell your home.Â And then there’s the question of whether you might wind up with as much money in your pocket as you’ve been hoping.Â And if a foreclosure pops up in your neighborhood, what then?Â Would you wind up feeling even more uneasy about selling?Â So, what to do? Look carefully at homes that are selling in the area, and those that are not selling.Â What’s the difference?Â Price is certainly a huge consideration, but so is appearance.Â A third factor—that is making more and more difference in whether a home sells these days—is how it’s marketed.Â Not all homes for sale get the same exposure. The fact that homes continue to sell—even in the middle of the constant barrage of negative news—clearly demonstrates that the local market continues to beÂ healthier than many people realize. Here’s another reason to feel that better times are ahead:Â Inventory—the number of homes for sale—fell by 19% during 2008.Â At the end of the year, there were 10,201 homes for sale, compared to 12,642 at the end of 2007.Â If that trend continues, then it’s safe to conclude that the ‘Buyer’s Market’ is beginning to shift more back into balance. If you’ve been thinking of selling your home, but are perplexed or somewhat uneasy about the current market and your prospects to sell, there’s an easy solution:Â Â Give us a call.Â We will be glad to take a close look at the history and trends of home sales, targeted to your neighborhood.Â We’ll then be able to present you with a projection of how long your home might need to sell, and at what price a buyer would consider reasonable.Â This could be valuable information to help you with selling during this around-the-clock negative news era. If you were an extra terrestrial planning a visit to Earth and tuned in some of the news reports before arriving, what would you think about our society, given headlines like the ones above? I might be tempted to keep on moving, and find another place to visit, where life doesn’t appear to be so gloomy. As we start 2009, we have some big choices to make. How prosperous do we want the year to be? But more important … how hard are we willing to actually work to achieve that goal? Or will we choose instead to live more in accordance with the negative portrayals and not even try to make it a positive year? I find it interesting to see the contrasts in views about our economy right now. Quite a few of the people we know and work with here in the Shelby county/Birmingham area are remarkably upbeat. 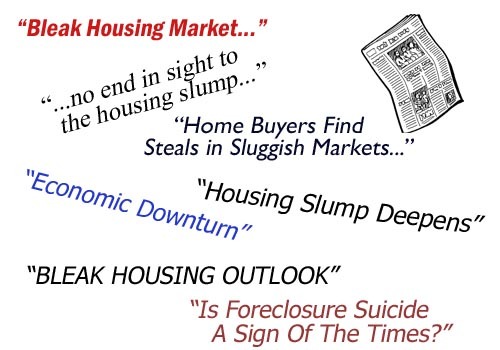 That optimism still manages to shine through, despite a challenging 2008 and constant pessimistic predictions so prevalent in the media about the real estate, financial markets and world markets in general. Colleen and I have wound up explaining—more than once—that, contrary to popular belief, the home sales market in Shelby county and Birmingham is still pretty healthy, despite downward trends in the area during 2008. And I think back to a few days before Christmas when The Birmingham News ran a story about a “silent” mall where holiday shoppers were a scarcity. Later that afternoon, as we passed the Galleria on I-459, we observed traffic backed up on the flyer-over ramp onto the interstate, waiting to pour in to the Galleria and Patton Creek. The newspaper wasn’t lying. But I wasn’t getting the full picture, either. Want to keep balance in your perspective? My suggestion is to look around and decide for yourself. There are positive developments that affect the way we live and do business, and it’s not just happy talk. But you don’t hear as much about them. I’ve heard more than one person ask recently, “who would have ever thought gas would be this cheap?” While it’s anyone’s guess as to how long oil prices will stay where they are, there is still the inescapable fact that our national economy and virtually every business and industry, large or small, are benefiting in many ways. So, what kind of year will 2009 turn out to be? When you listen to the talking heads and so-called ‘experts’ giving their predictions, remember that some of them just flat get it wrong sometimes. Alan Greenspan, former head of the Federal Reserve, maintained in 2002 and into the following year that there was not going to be a housing market bubble. He later admitted he was wrong. Part of getting the big picture, I think, means listening to those people, but staying careful not to put 100% confidence in everything they say. I think we all have a lot more ability than we typically realize to control our financial and economic prosperity and destiny, rather than just citing bad or good luck, as so many often tend to do. But we’ll only prosper by having the full picture in front of us to start with. And then there’s the work involved to make it happen. Here’s hoping your 2009 really is a prosperous one.